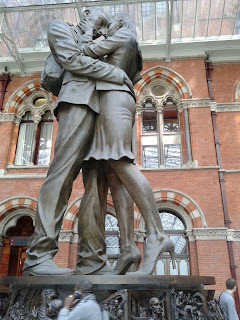 After a day of rest coming into Paddington we mapped out our week according to the things we wanted to see, knowing we could not possibly do it all. 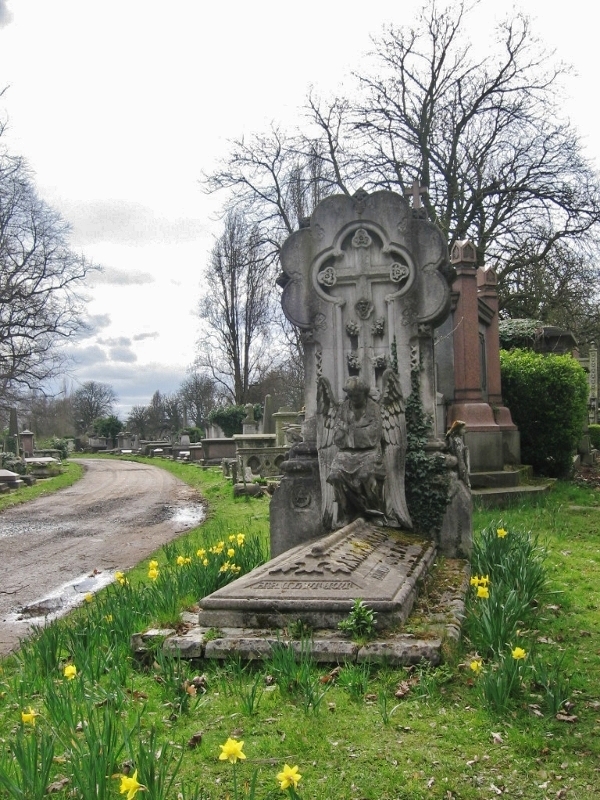 I had recently finished reading Her Fearful Symmetry by author Audrey Neffinegger, which took place at London's Highgate cemetery. 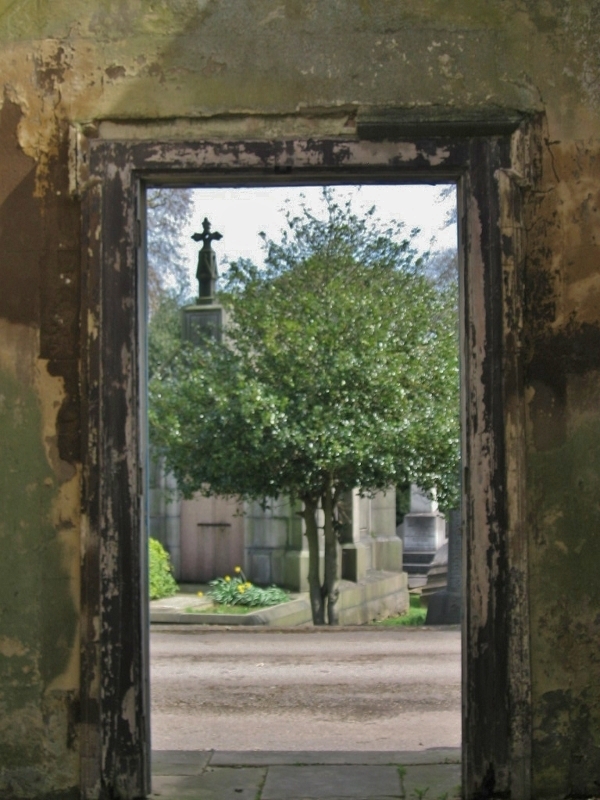 It was through this book I learned about cemetery tours and I thought it might be interesting to try it. 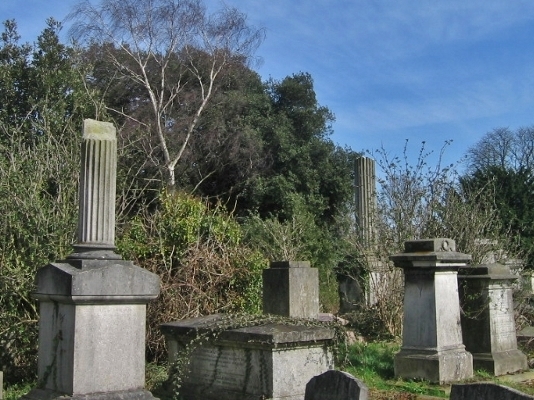 Boaters who've been into Paddington Basin from Bulls Bridge on the Grand Union know the canal passes right by Kensal Green Cemetery--seventy two acres of tombs and graves clothed in marble, cement, and old, overgrown trees bordered by two conservation areas and the canal. 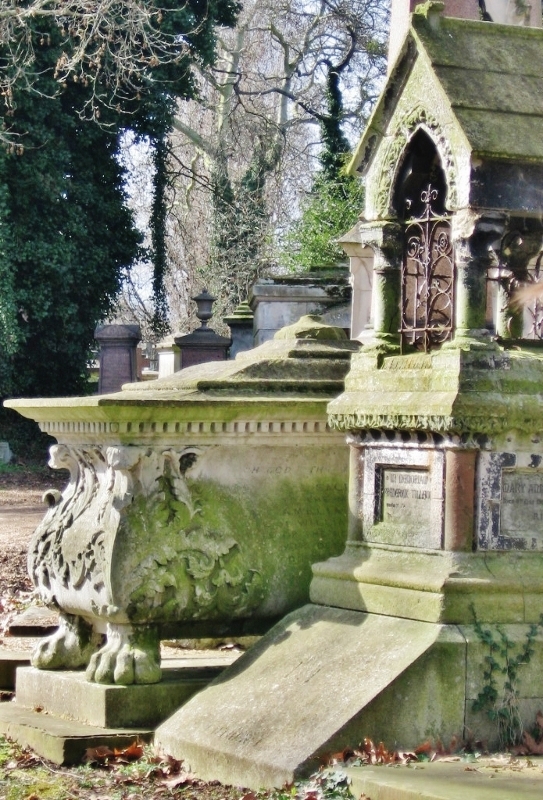 Founded in 1833 it is one of the oldest and largest burial grounds in London, housing the remains of royalty, the well to do gentry, and the respectable--and not so respectable bourgeoisie. 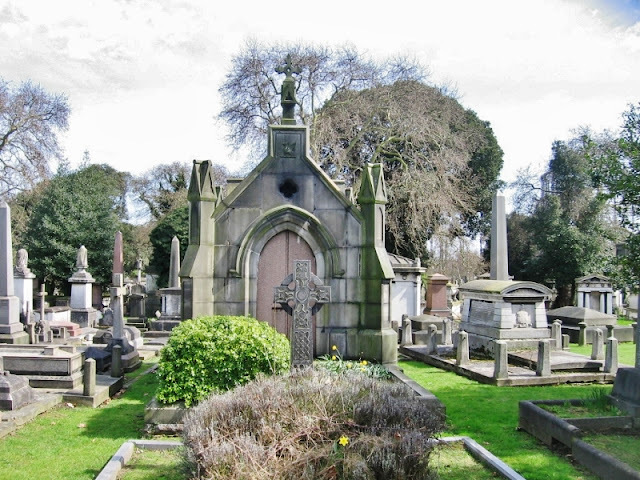 Burials and cremations still take place there today, with the city of the dead divided into those buried in consecrated Church of England ground and everyone else buried in unconsecrated earth. Les spent his childhood in Queens Park Estate near Paddington. 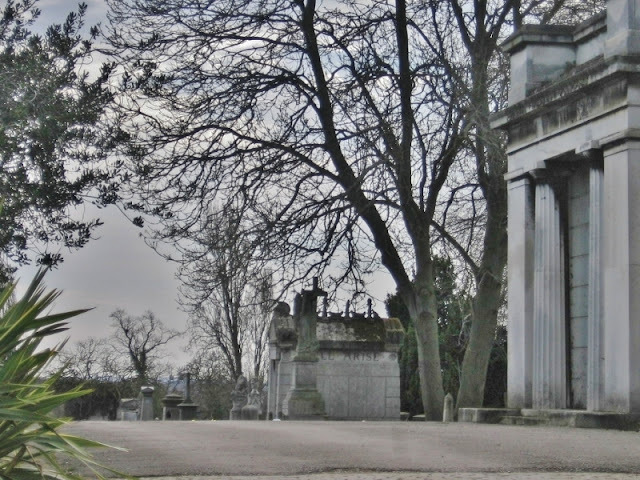 He used to sneak into this cemetery with friends to gather conkers. (For Americans, conkers are the hard shelled seed from the Horse Chestnut tree, which British children gather, bore holes through and tie string on them to bounce off each other in a game called Conkers.) Happy days; so we opted to take a tour of Kensal Green first, catching the bus from Paddington Basin, passing through Les' childhood haunts on the way. 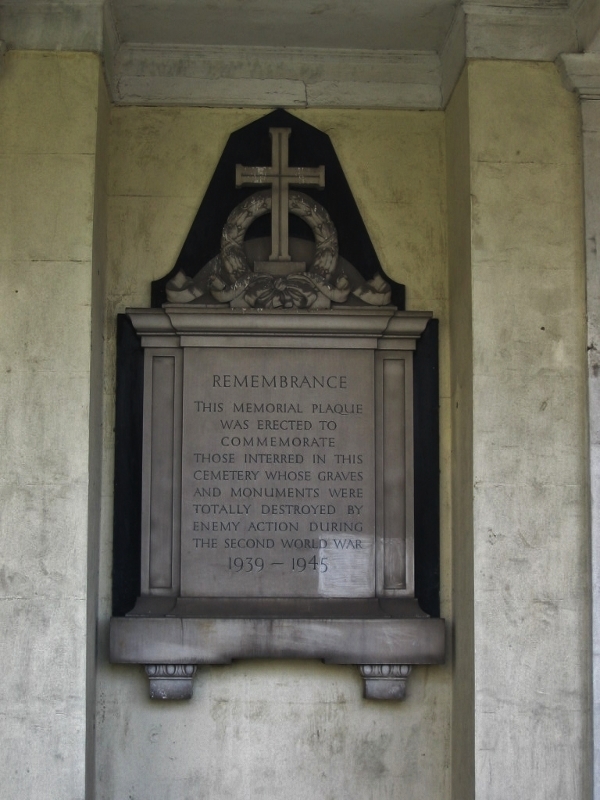 During World War II German bombs fell on Kensal Green, destroying the chapel roof and breaking off some of the burial monument columns, which have been left for all to view in their broken state. 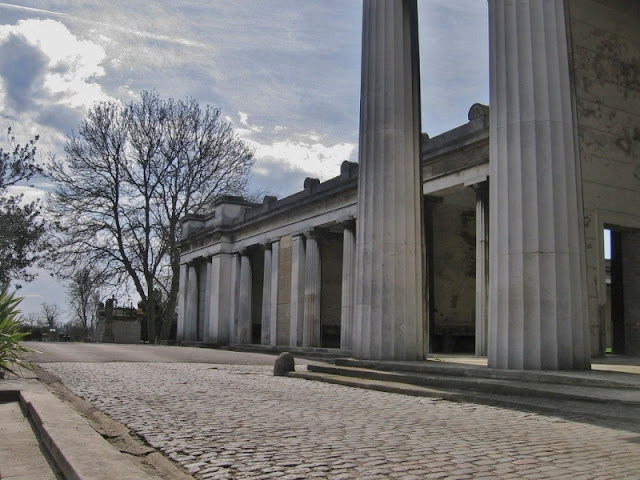 The tour starts here at the roofless Anglican chapel with its wide carriage way dominated by marble columns. I love the far reaching vistas in the city of the dead. The ground is sacrosanct, not the view or the sky. 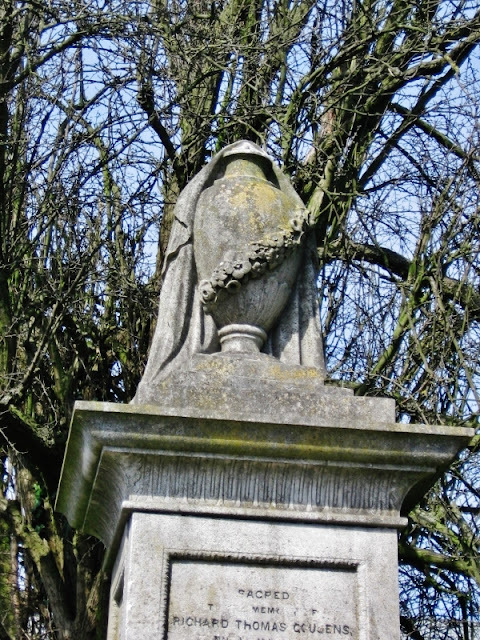 Georgina Clements, beloved daughter, born 1834. Her tombs rests amongst the chapel's marble columns. 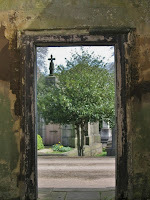 ...and granite epitaphs reach for the skies. 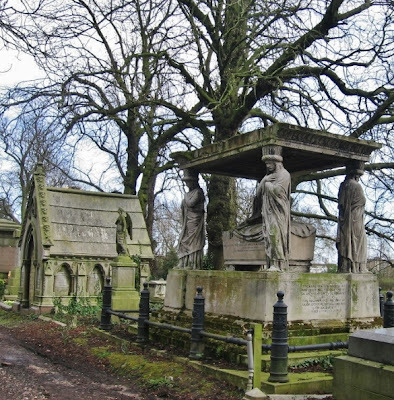 Many are the grave stones with draped urns depict the ancient Roman style of mourning their dead. Recognized as an ancient symbol for death (do in part to the cremation rituals practiced in the past), the urn represents the return of the body back to ashes and dust, leading to the soul’s rebirth into the next realm. When shown draped with a cloth, the cloth is representative of death, the final partition separating the living world from that of the dead. Some of the monuments resemble giant soup tureens; others appear to be bird cages to capture the fleeting soul. 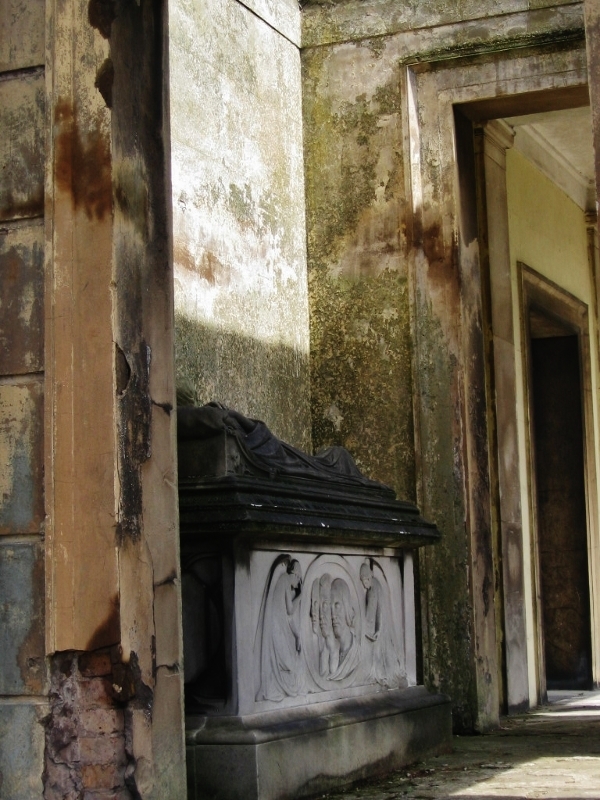 Below, Someone rests eternally under a beautiful Gothic Revival porch. Kensal Green abounds with mausoleums, crypts and tombs. What is the difference one may ask? 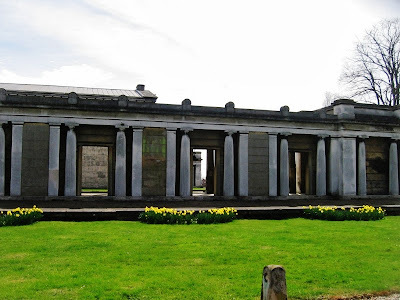 A mausoleum is an above ground structure in which one or more bodies may be laid. The Taj Mahal in India, and the Tomb of the Unknown Soldier in Washington D.C. USA are both examples of well known mausoleums. A crypt is a burial spot built to hold a casket, like the "tureen" a few pictures back, which houses the remains of one person. Crypts were commonly located beneath the floors of Christian churches as far back as 600 A.C.E. 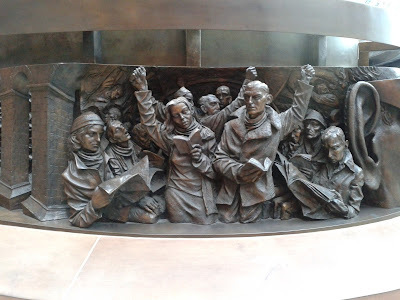 We walk over the worn tomb stones embedded in the church aisles as we view the wonders of the old churches, chapels, and impressive cathedrals here in Britain. 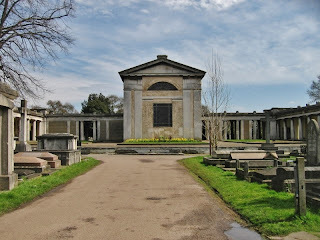 A tomb is the container which holds the deceased remains. 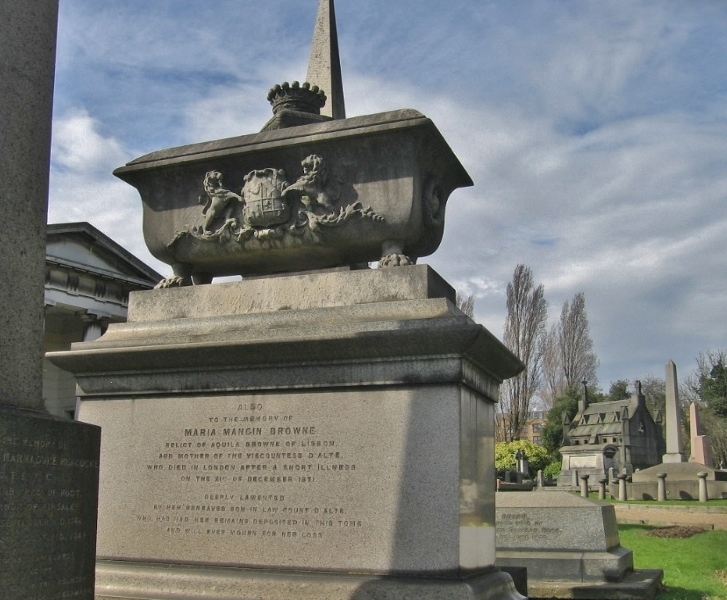 A casket for those whose bodies are buried, or an urn for those who are cremated. 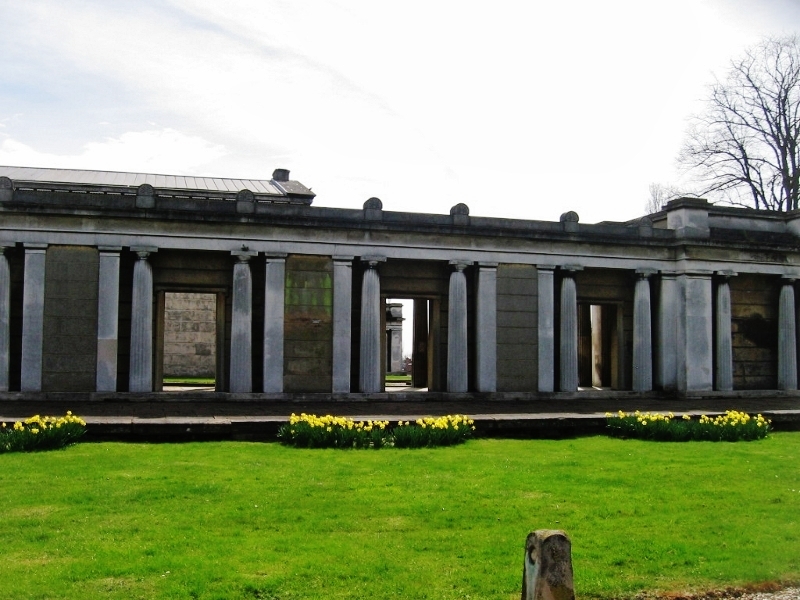 Tombs and crypts are below ground and mausoleums are above ground. 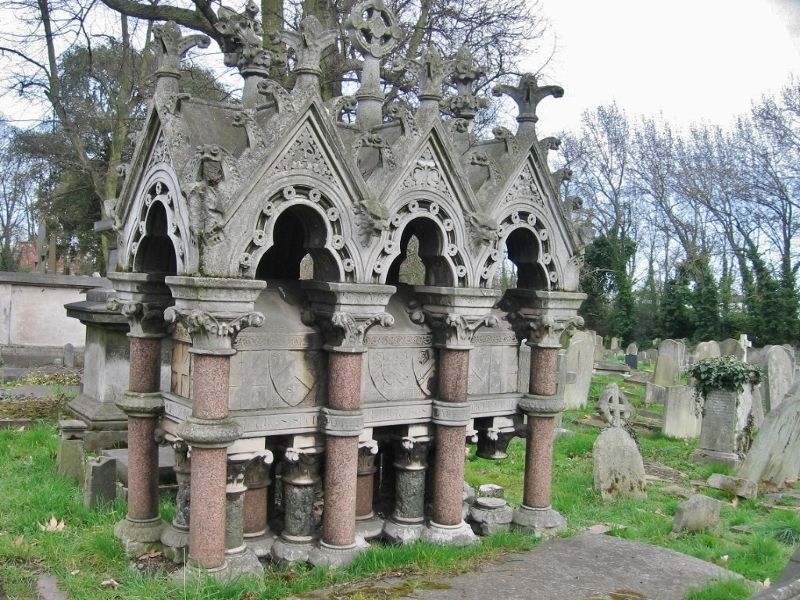 While Kensal Green does not have one, there is also something called an ossuary, which is a place built to hold human skeletal remains. "To the Memory of Maria Mangin Browne, relict (widow) of Aquila Browne of Lisbon and mother of the Viscountess of D'Alte, who died in London after a short illness on the 21st of December, 1871; deeply lamented by her bereaved son-in-law Count D'Alte who has had her remains deposited in this tomb and will ever mourn for her loss.." Wow! Now that is a a devoted son-in-law! Maria's epitaph makes me wonder what kind of mother-in-law she was to inspire such endless grief and mourning. Another lane leads away to a different neighborhood. 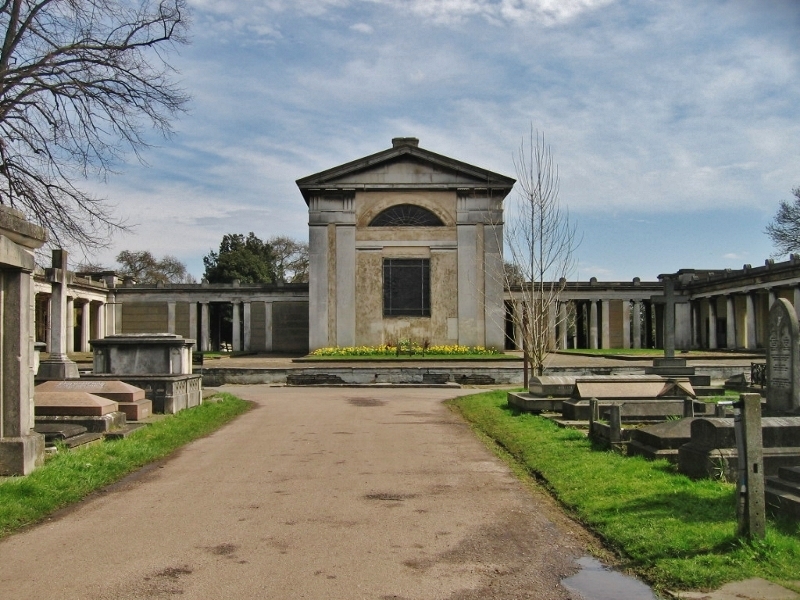 Once the first royals--the Earl of Sussex and the Royal Princess Sophia, daughter of King George III--deigned to lay their mortal remains here, this cemetery became a stylish place for the dead to be interred, especially since one may not afford to live as an equal or a close neighbor of royalty in this life but when dead it is possible to settle in right next door--literally! while a nearby angels clasps its hands and weeps silently. 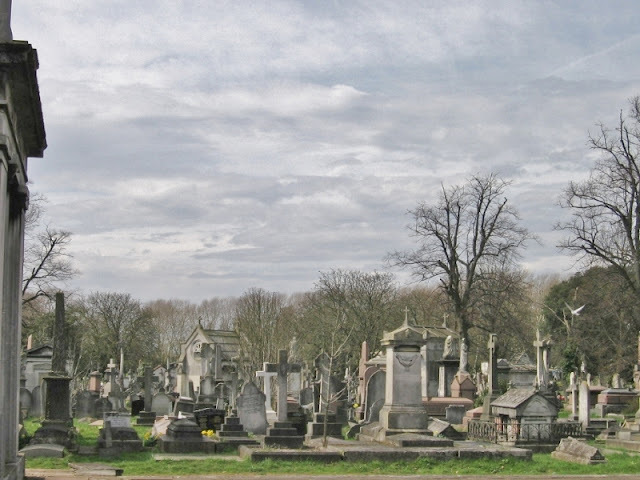 There are as many different styles of monument and tomb stones as one can imagine in a cemetery as large as Kensal Green. 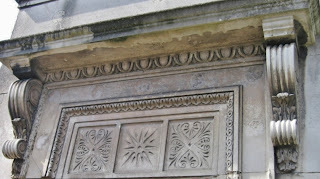 Grave symbolism is not accidental; everything is laden with meaning amongst the houses of the dead. Down this lane graves are grand with Gothic revival, statuary, garlands, upside down torches, bee hives, Masonic symbols, and angels in various poses. 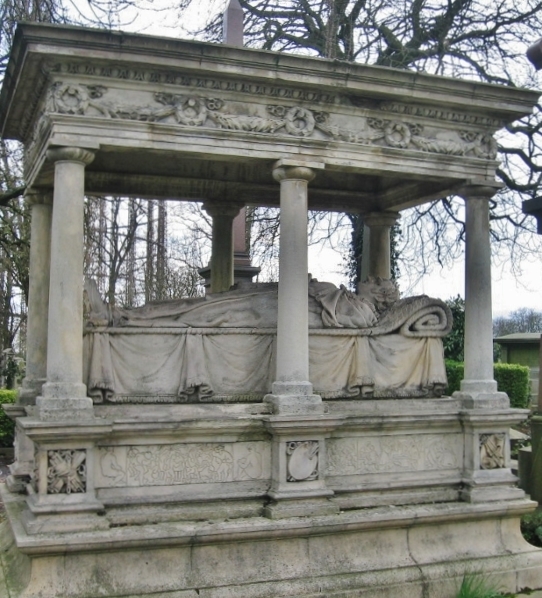 The tomb of "William Holland of Clarendon Place, Maida Vale, died 27th September, 1856" is rife with symbolism. The outward facing angels stand as guardians at each corner of the tomb, intermediaries between humans and God. 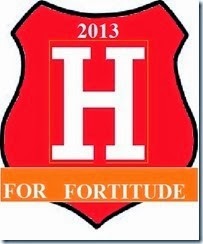 The wreaths held between the angels stand for victory, honor and eternal life. Torches don't burn upside down--unless they are carved for eternity on the side of a tomb, representing everlasting life. 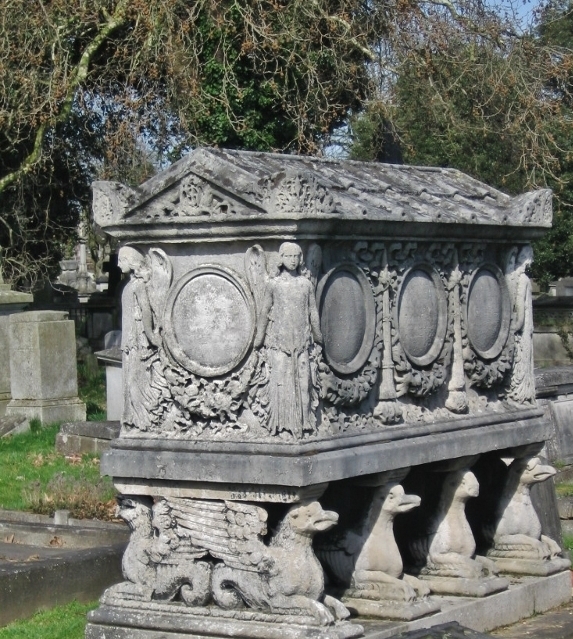 The winged griffons are tomb guardians protecting the remains; the dolphins tail they sport symbolizes their ability to bear the soul of the dead to heaven. 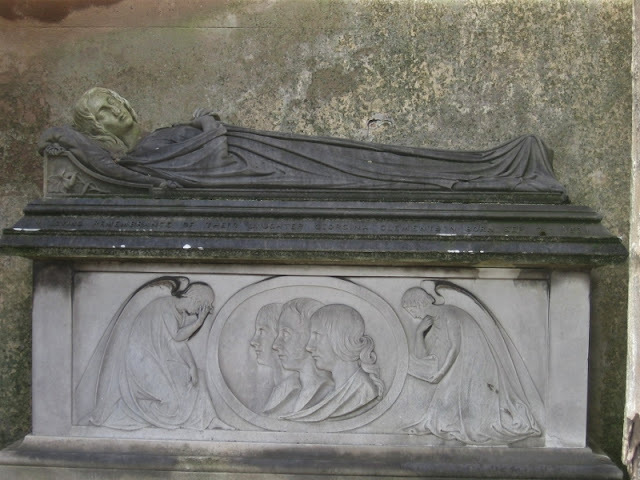 To me this is the tomb of a person frightened of what may happen after death, seeking every possible assurance of peace in the afterlife with rest in heaven. 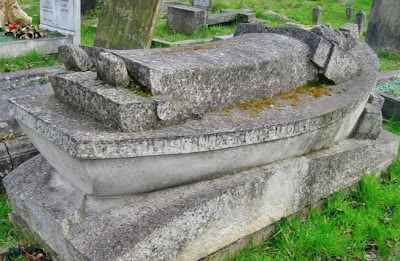 The symbols on this impedimented grave stone are modern and other than the sunburst pattern representing eternal life, have no specific symbolism pertaining to the grave. 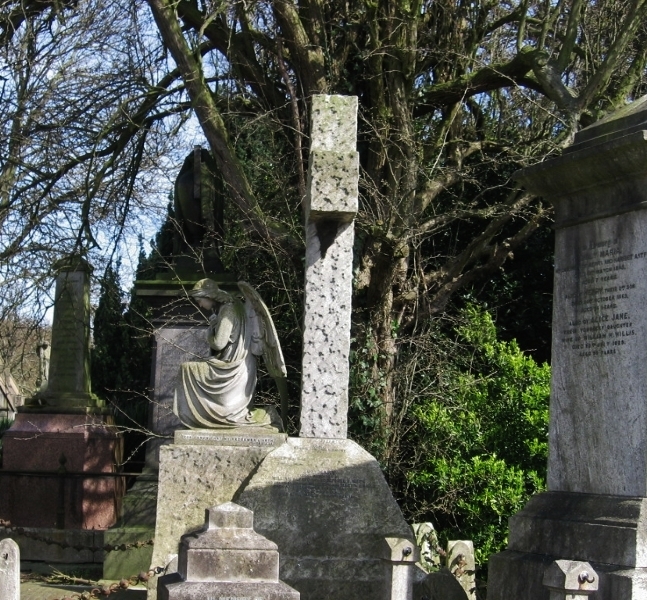 This neighborhood is marked by Egyptian stylized obelisks and a Celtic cross. 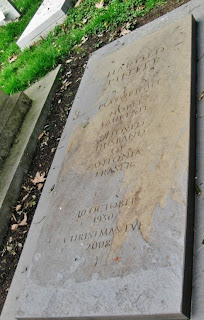 Leaving the older and more gentrified area of graves, one finds some interesting modern stones as well as those marking the resting places of famous artists and writers. 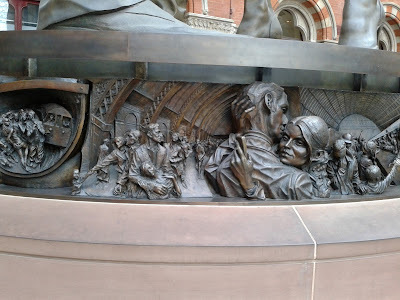 This lovely stone depicting its interred citizen resting atop a boat, readied for his journey makes me think of my favorite saying regarding death: Because my ship has sailed from sight it does not mean my journey ends; it only means the river bends. 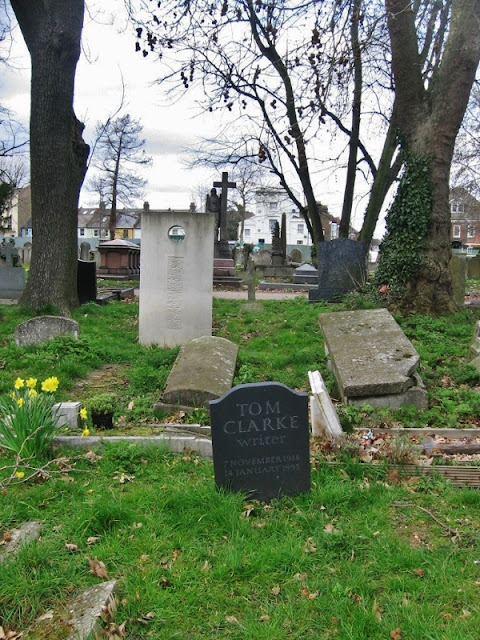 Tom Clark, (7 November 1918 – 15 January 1993) was an English screenwriter, creating English plays, drama series and sitcoms. I really like the grave stone behind Clark's with the circle carved out of it and the stylized ripple marks below. 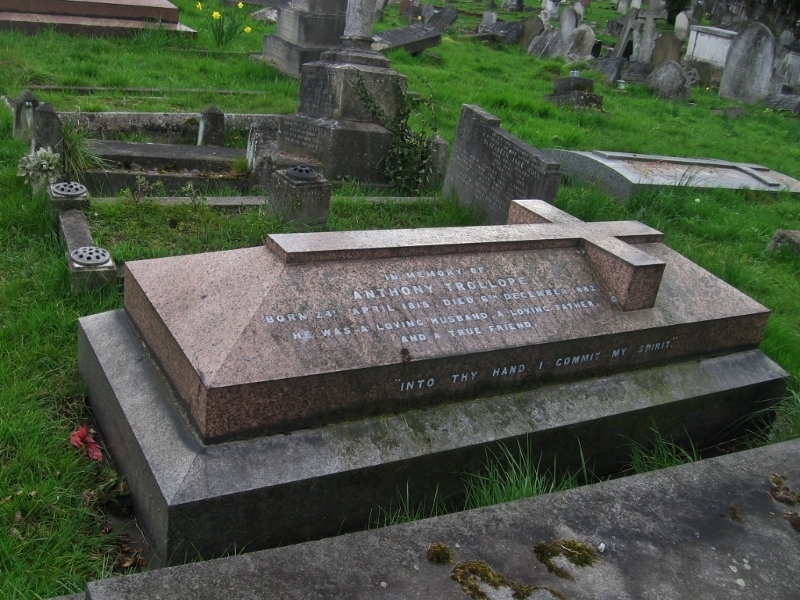 There is no epitaph on it at all, leaving one to wonder about the inhabitant of this modern grave. To the left is Playwright Harold Pinter's grave stone. Most of the really famous folks have very plain stones which do not call attention to their earthly notoriety. The grave on right is that of Eon Records producer and musician Ian David Loveday, who died in 2009. 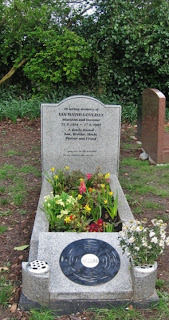 For our friend Sandy Field, here lies your favorite author, Anthony Trollope. 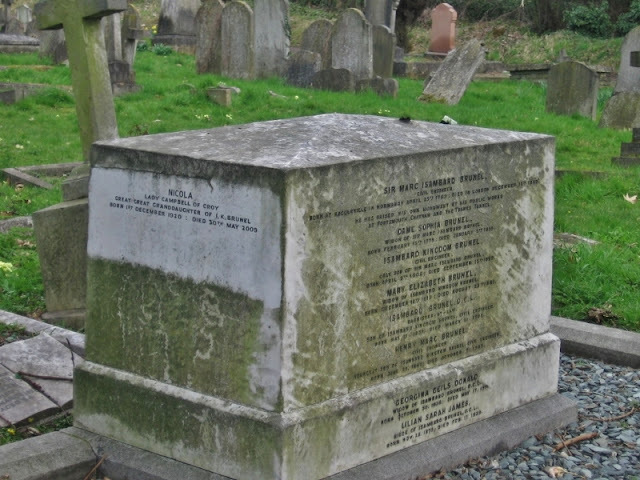 Most Brits will be surprised indeed at this very unadorned tombstone for the Brunel family, which marks the resting place of nine family members: Sir Marc Isambard Brunel, Civil Engineer; his wife Dame Sophie Brunel; their son Isambard Kingdom Brunel, civil engineer; his wife Mary Elizabeth Brunel; their sons Isambard Brunel, DCL (honorary doctorate), Henry Marc Brunel, civil engineer; Georgina Geils Donald, Widow of Isambard Brunel the younger; Lillian Sarah James, niece of Isambard Kingdom Brunel; Nicola, Lady Campbell of Croy, great great granddaughter of Isambard Kingdom Brunel. Isambard K. Brunel was an English mechanical and civil engineer who built dockyards, the Great Western Railway, a series of steamships including the first propeller-driven transatlantic steamship and numerous important bridges and tunnels. His designs revolutionized public transport and modern engineering. 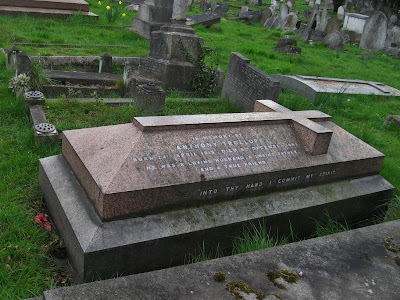 Finally the first of my two favorite graves in Kensal Green: "Together in peace, Kevin and Ted, at Rest." Obviously a gay couple who may not have been afforded togetherness in peace during their lifetimes. I was quite touched. It is a sad commentary on society that one might have to wait to die before an allowance of the same courtesies, liberties, and rights as heterosexual couples experience as a matter of course. 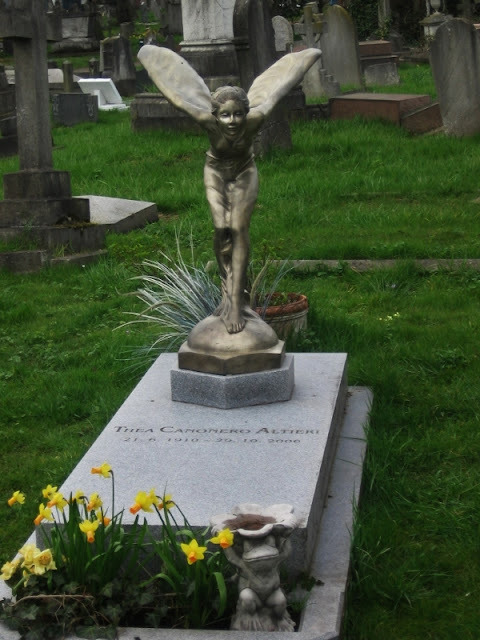 "Thea Cannonero Altieri, born June 21st, 1910; died October 29, 2000." She isn't a star, neither famous 'nor infamous, but the deceased certainly had amazing taste! I love the Rolls Royce Silver Lady hood ornament aka The Spirit of Ecstasy leaning over Thea's grave. I'll bet Ms. Altieri was a very interesting woman! 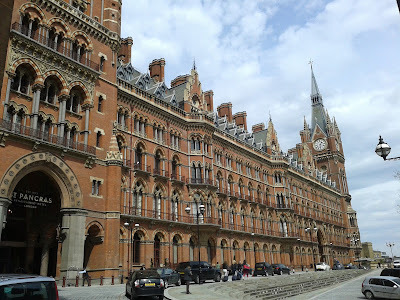 St Pancras station built by the Midland Railway Company in 1864 and completed four years later. The front was constructed as the Midland Grand hotel to bring more revenue to the railway company. Six years and £800million was spent in 2001 to re-furbish the station interior to be able to accept the Eurostar trains. 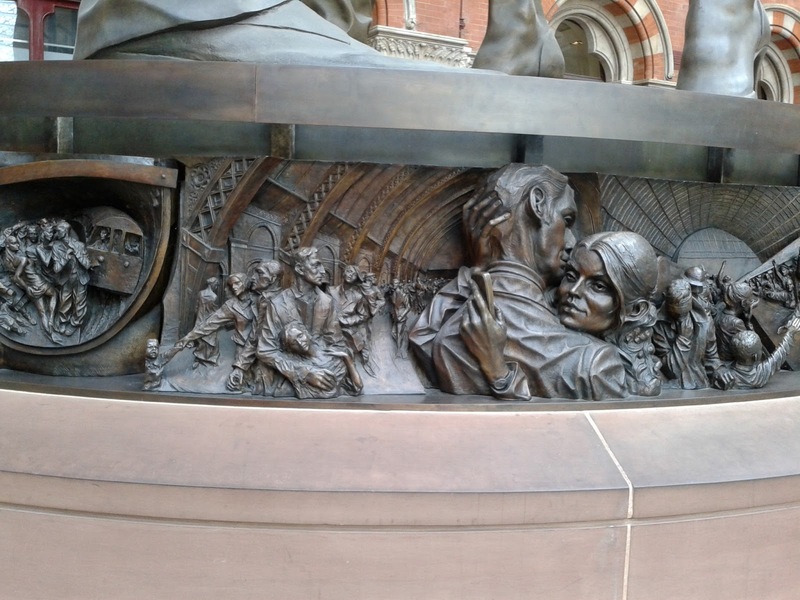 The hotel was brought back to life after being used as offices under the name St. Pancras Chambers. It is also still the terminus for Midland mainline trains and below ground is the Thameslink line that links the north of London to the south. Also deep below ground are the six underground lines that serve this and next door Kings Cross stations. The lower level once served as storage space that was rented from the railway company but is now a mini shopping centre. The iron girder arch designed by William Barlow spans the platforms and is 698 feet long, 240 feet wide and a 100 feet high. It was at the time the largest enclosed space in the world. In the 1960`s under the ownership of our nationalised rail company `British Railways` (remember them) it was planned to demolish it. 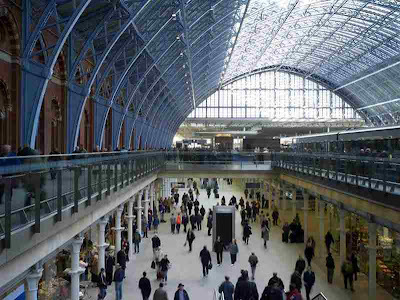 Sir John Betjeman fought tooth and nail -where does that saying come from?- to save it and it was eventually made a Grade I listed building and a fine Victorian Gothic building survives. 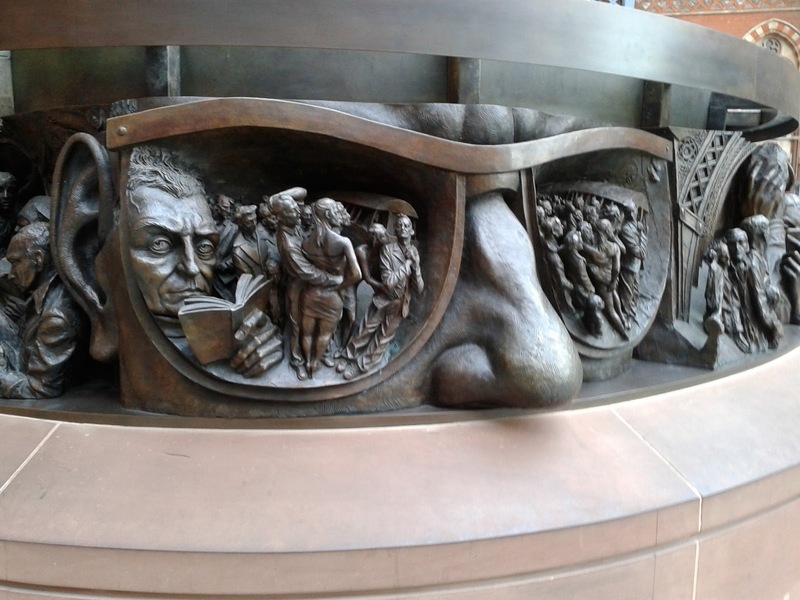 Below a few of the scenes around the base of the Paul Day Meeting Place sculpture. Just out for a stroll in London and this rather nice shiny bus caught my eye. It looked pretty much the same as all the other Red buses but looking along the side it looked different. 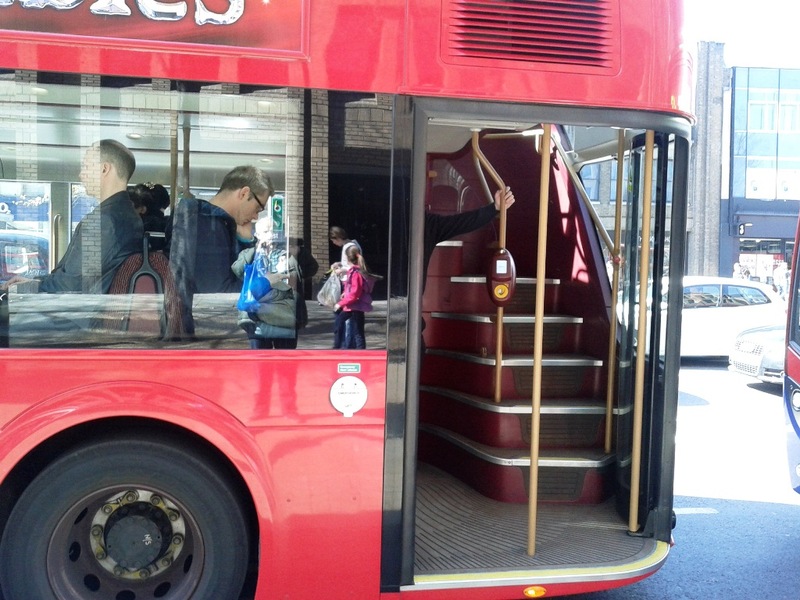 As you can see it has the normal front entrance and centre exit doors but at the rear it had gone back to the days (40+ years ago) when I drove buses for London Transport, it had an open rear platform. I was under the impression that this set up was used when buses had a conductor to supervise the loading of passengers and collect fares. It was the saving of the conductors salary that brought about the OMO bus or One Man Operated. Personally I think this rear door is a big mistake the man (you can just see his arm holding the rail) has to be paid to stand there doing nothing. He has no fares to collect as the Oyster card system has replaced, almost, all cash ticket purchases. Of course in my bus driving days buses were run by London Transport that covered not just central areas in and around London but also out into the countryside under the umbrella of London Country buses. Now I would not like to hazard a guess as to how many different companies run the bus routes in and around the capital. Of course London`s Red buses come under the control of Transport for London and Boris the Mayor of London. 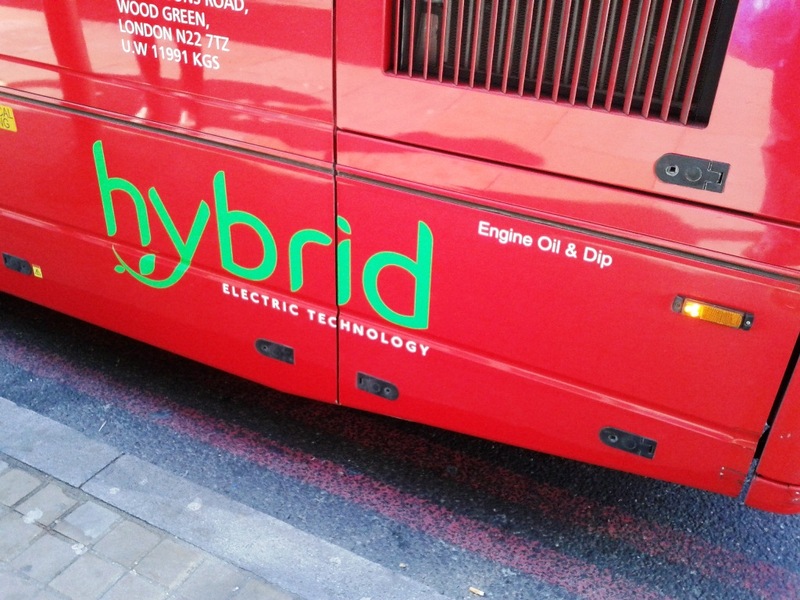 It was nice to see a lot of hybrid buses in use which is a step forward but Boris your open back deck scheme is not worth the expense. Once the driver shuts the doors on the OMO system this stops a number of dangerous situations arising. I have seen people dragged along after trying to jump aboard an open back bus. Also I once witnessed someone tripping down the stairs and rolling off the rear platform into the road, luckily no car was following the bus. 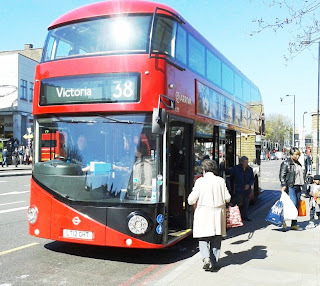 I remember my training to be a bus driver took place at Chiswick bus works. Part of the training was a session on the skid patch within the works on it`s own internal road system. The window behind the driver was removed and the instructor would reach through and pull the steering wheel round and at the same time apply the handbrake. All that remained was the poor driver had to regain control (no power steering) and get the bus to end up in a pre determined position. If you watch the link below you will see lots of people watching in front of the training building. I remember a time when one trainee got it wrong and almost hit the building, needless to say the area cleared in seconds. 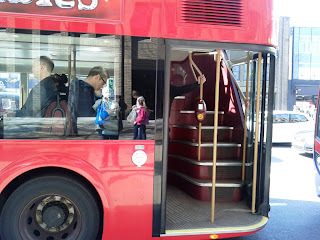 Seeing the Red buses brought back memories of 3 years bus driving when I was 21. 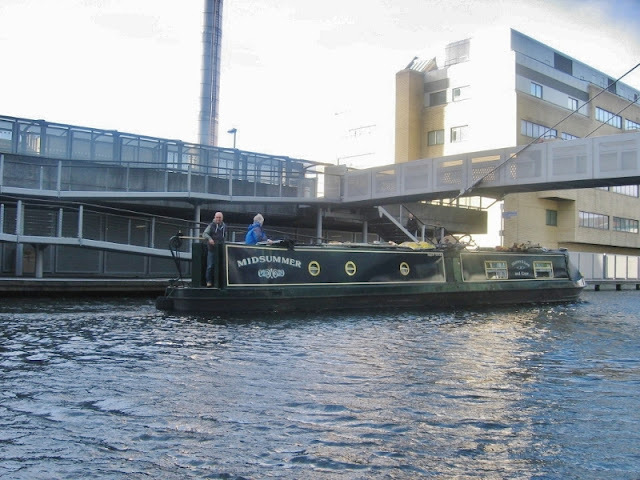 We arrived in Paddington Basin to a warm welcome from friends Jacquie and Stein on Like Ducks 2 Water, accompanied by Lou and Sharon on Midsummer. After an hour nattering over wine we wove back to our boat on the other side of the basin and settled in for an amazing week. We knew our friend Carol Ives would come visit as she lives in Stratford and always comes to see us whenever we make it to her neck of the woods. Arriving with a gorgeous bouquet of roses and a lovely bottle of White Zinfandel (Les likes dry white wine; I like sweet white wine or Shiraz. But we both enjoy White Zinfandel or Merlot Rose. Mmmmm! ), Carol blew in like a fresh spring breeze and we had a lovely afternoon catching up over a lunch of Tapp Sandwiches, potato salad, and freshly baked-still-warm Cherry Almond Bakewell tart. What didn't we discuss? 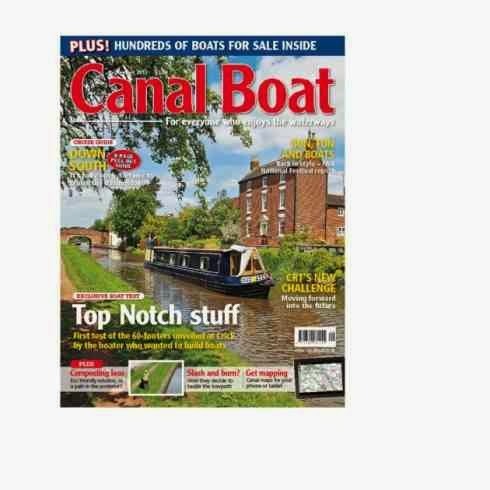 Carol loves narrow boats and has had many a good holiday on the canals. She is definitely thinking about selling up and buying a boat someday. So of course the conversation eventually came around to loos! It always does with narrow boaters. 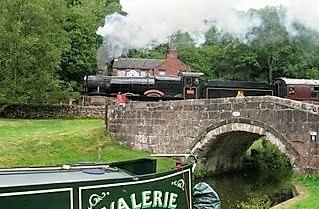 Earlier in the day while we were watching enthralled and delighted by the mechanics of the rolling bridge, another boater came up and said hello: it was Adam Porter from Briar Rose! Working in London and living in Surrey with his partner Adrian, Adam had read our blog and knew exactly where to find us. Adam and Les discussing Airhead composting loos! Over a cup of tea (sorry Adam the Bakewell tart wasn't ready yet!) he told us he wanted to interview us for a Canal Boat magazine article. Guess what the topic touches on???? Composting toilets! 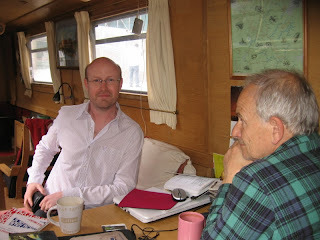 Of course we bent Adam's ear about how much we love our loo and how practical an Airhead is on a narrow boat. We also told him about boaters Ken and Sue Deveson on NB Cleddau who first showed us theirs, and our mutual friends Chris and Genny Gash whose boat Tentatrice is being built as I write, with a brand new install of an Airhead composting loo. Adam knew about George and Carol on Rock 'n' Roll, so he left with a lot of information and has our permission to borrow any info or pictures we posted on our web regarding our composting loo. Two days after we arrived, Jacquie and Stein and Lour and Sharon said goodbye, heading for the splendors of the Lee Navigation. Arriving midweek after them it was Andante! 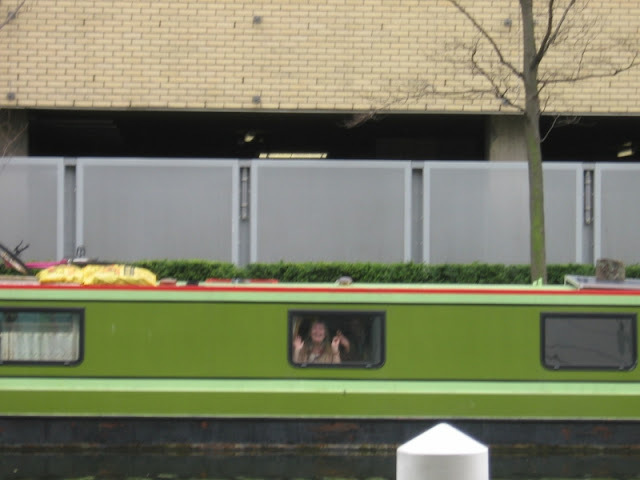 Jacquie and Stein wave as they head out of Paddington Basin. Lou and Sharon wave good bye! Andante waving hello to us from across Paddington Basin. They were watching the Rolling Bridge. Are you a city banker? Always dreamt of living on the high seas? Love the dining out/ wine bar scene? Have you got loads of money? Read on for I have found the location of your dreams. The good ship MV Dana for sale at £950,000 ($1.42million) and no Americans it does not include half the City of London. Connected to all services and even has it`s own post/zip code. 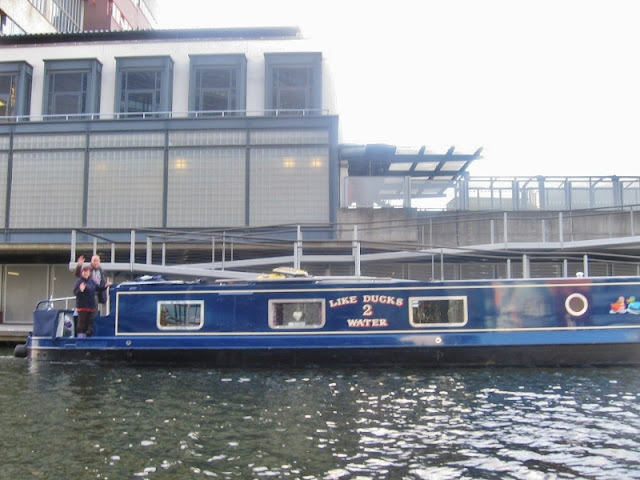 It is located at West India Quay which is on the R. Thames that connects to the high seas. The price by the way does not include the mooring fee. As far as I can find out on the web the mooring fee is circa £12,000 ($18,000) per annum. Standing at the end of your property you have if your in the banking business a view of your work place assuming it`s the HSBC tower. To your left plenty of wine bars and restaurants in what were the old dock warehouses. 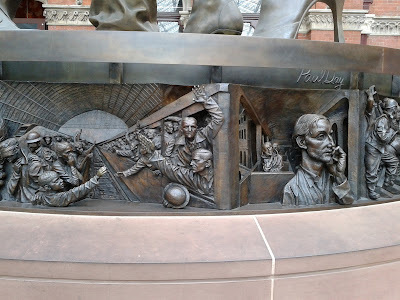 Also just out of shot to the left is the Docklands museum where you can have a pleasant look around at the history of the London docks, and it`s free says Jaq. To your right you have the Canary Wharf tower and loads of shopping if you have loads of money which you must have to be reading my sales pitch. Oh! I nearly forgot you have your own private bridge into Canary Wharf. Well ok owing to some legal thingy called right of way a few thousand others use the bridge daily. Just next door your neighbours can arrange your marriage on MV Leven is Strijd and hold the reception.